On the inside of the band, which is heavy with a flat edge at one side and curved edge at the other. I'm guessing that the flat edge was to better accommodate an engagement ring alonside. Am presuming: English gold, 18 karat, assayed in Birmingham possibly 1921. The W could also signify an earlier date but as she was married in 1923 the date stamp for 1921 would seem realistic. 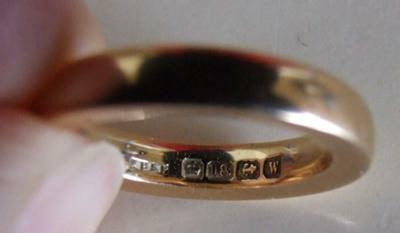 However, I haven't been able to find anything on the Goldsmith initials KBSP so any help would be greatly appreciated.